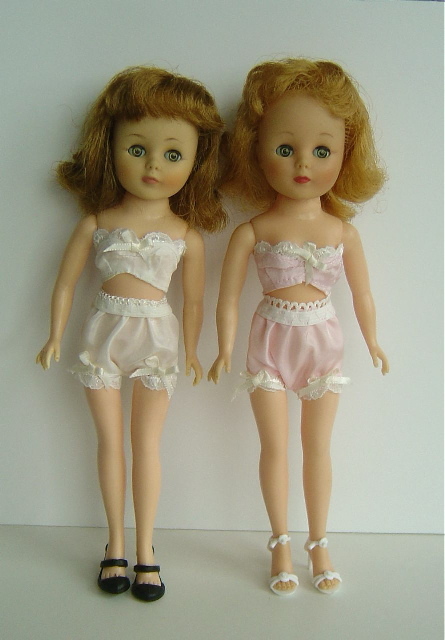 When introduced in 1958, the upscale and incredibly pretty TONI doll was the result of one of the first product tie-ins - she was named after a popular home permanent wave. Her thick, styleable hair was another first - it was made from the new 'miracle' fibre, nylon - and came in four colours: light blonde, medium blonde, auburn or brunette. TONI was a huge success and had a potentially vast wardrobe. Over 100 high-quality outfits were available - many of these were also made from nylon. Originally, the TONI doll came in several sizes, but we sell the 10.5 inch/25cm version because she works perfectly as an older sister, or young mother for our little girl dolls.